I will probably get The Bad Mother ticket in the mail any day now for letting my 16-year-old son jump off this cliff into the water. His knees buckled on impact and jammed his face, breaking his nose. We took him to the ER. He’s fine now, but it shook us up. What if he had been knocked unconscious? Oh my. That is one high cliff! Glad he is OK.
yipers, that looks scary! glad he is ok.
Oh, that must have been awful. I sympathize with your mother worry. No, you’re not bad. Stuff happens (and sixteen-year-olds can be very persuasive…at least mine always was). I’m so glad he’s okay! Oh no, just after I commented that it sounds as if you’re having a good time. That’s awful, I’m so sorry. Yikes, what a dreadful thing to happen. Hope he’s okay now. He’s fine, except he needs to be careful not to bang his nose. He whacked himself in the face the other day while climbing and it started to bleed again. Argh! You had to let him jump if it looked safe or at least survivable to you and you generally trust his impulses. Most kids (and people) won’t aspire to do something unless they have a feeling in their bones they can do it. I’d say you get the good mothering award. Too bad about the broken nose but he has a battle scar and a story to tell, and now he knows that from that height, water is a solid, and he has to slice into the surface. 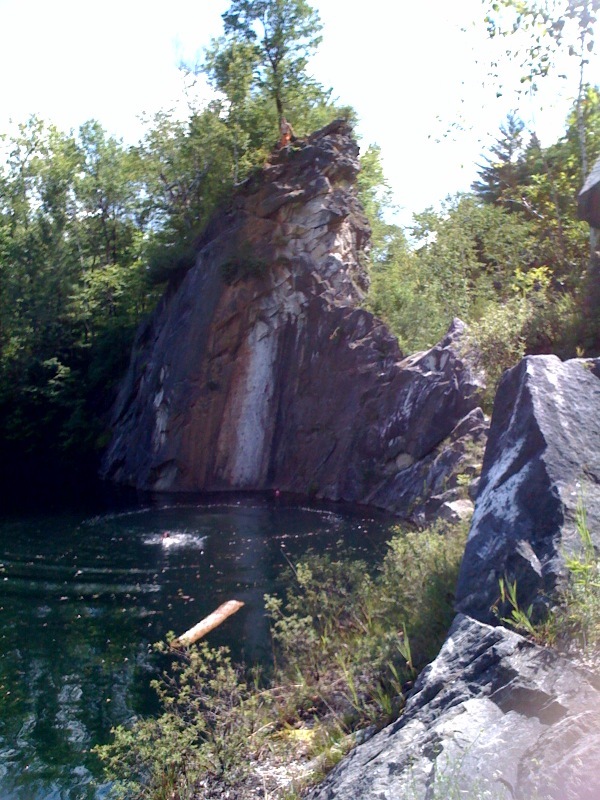 If he had been knocked unconscious it could have been serious, those New England quarry ponds can be very deep. Now you know. Have a spotter near. I just read your most recent post. Good luck with the MFA program. Going back to school as an adult can be really hard but you seem to have a lot of support and inner resources. Too bad you have to break away from the collaborations with Jo. Great projects, by the way.